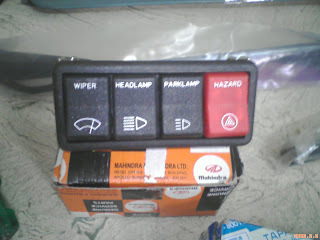 The difficult part of the project is getting all the right spares, I could manage to get some relevant spares for the jeep. However there are still problems in many areas. wherever there is no on the stock spares, I have decided to fabricate them. 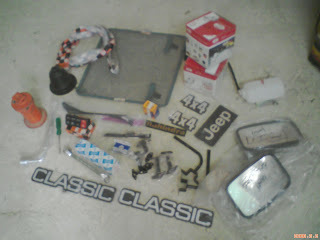 Above picture shows the first part of spares I procured for the jeep. You can see the piano switch which is not the orginal Classic's piano switch. This one is bigger than the original as the latest jeeps got this type(Probably here I made a compromise.). I have managed to order a set of 5 spokes wheels, I will take one for my spare and I will sell the other four as the distributor accepts order for 5 nos. only. i want 4 spoke wheels for my mahindra classis jeeep . can please help me find them. fro where did u get the mag wheels ? Pse share with me about source of Spoke wheels of CL. The same is urgently required for baby of 2010 model.